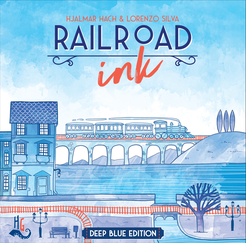 Railroad Ink comes in two versions, each one including two expansions with additional dice sets that add new special rules to your games. The Deep Blue Edition includes the Rivers and Lakes expansions. Increase the difficulty by adding the River route into the mix, or use the Lakes to connect your networks by ferry. These special rules can spice up things and make each game play and feel different. Each box allows you to play from 1 to 6 players, and if you combine more boxes, you can play with up to 12 players (or more). The only limit to the number of players is the number of boards you have!